Single dads can be more responsible. 2 How do I Date a Single Mom & Accept Her Child? If you’ve never dated a man with children, it can be a different experience than dating a childless man. The single dad must care for those who will remain dependent on him for 18-plus years, which means it’s important to have realistic expectations when dating him. However, when experts offer advice on dating men with children, they often focus on the challenges. Fortunately, dating a single dad also comes with many advantages. Anyone who’s ever had children -- or even baby-sat -- knows that caring for them is a lot of work. When you have kids, it’s a lifetime commitment, and you often have to put the needs of your kids before your own. Because of this, single dads can be more mature, responsible and giving. They’ve learned how to care for someone other than themselves. This level of maturity often translates into a relationship, and a single dad can make an excellent partner. The single dad can be a good choice for women who like kids but don’t necessarily plan to have children of their own. This can be true whether you don’t want to bear your own children or you already have but don’t plan to have any more. With the single dad, you get to have children in your life and even get a taste of parenting without the complete commitment of carrying, birthing and raising a child. In our adult lives filled with working and taking care of things, we often forget what it feels like to just have fun, the way a kid knows how to naturally. Dating a man with children gives you an excuse to relive the joy of going to an amusement park, zoo or beach, as well as enjoying fun activities such as going swimming, seeing animated movies or feeding the ducks at the park. Kids can have an innocence and zest for life that’s contagious. If you are heavily invested in your career or simply like your freedom and independence, a man with children may demand less from you than one who’s childless. A certain amount of the single dad’s time will be spent on parental duties such as preparing meals, picking kids up from school or attending their soccer games and dance recitals. 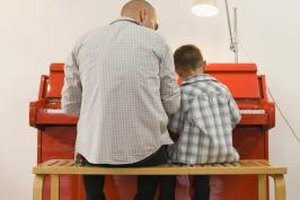 This not only allows you to take some of that time for yourself, it allows the kids more alone time with their dad, which is healthy for them. Christie Hartman is a psychologist and author of five dating and relationship books. She has written for several online publications and has been published in numerous scientific journals in the areas of mental health and addiction. Christie earned her master’s and doctoral degrees from the University of Colorado. What Does It Mean When Men Bring Up Marriage? How Should a Divorced Mom Talk to Teenage Kids About Her Dating?